The result of the project's compilation is a .TPC binary file, which contains the p-code and is uploaded onto the target device for execution. The .TPC binary does not include TiOS. It is expected that the target device already has TiOS preloaded or nothing described below and in the Debugging chapter will work. There is a way to combine TiOS with the .TPC file. A project's binary can be compiled for debug or release. This is selected in the drop-down on the Debug toolbar (or set in the Project Settings dialog). A debug binary doesn't execute automatically. It waits for TIDE to send control commands and make it run, break, etc. This is covered in DEBUGGING. Release binaries run immediately after the device is powered up (or the new binary is uploaded). All debug functions on release binaries are disabled. The upload is always performed to the currently selected target, and the selection is made in the Device Explorer. 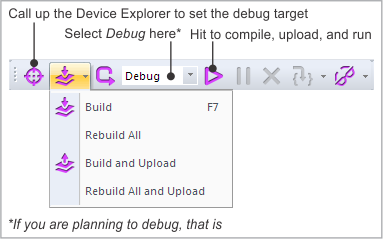 Hit [F5] or Debug > Run to have your project saved, compiled, uploaded onto the target, and ordered to start executing. The status bar will show you the upload progress. Naturally, the upload won't start if the compilation yields error(s). The execution won't happen if the upload fails. (More). After the successful build and upload, the execution will start both in the debug and release modes, but this will happen for two different reasons. In the debug mode, TIDE will send a "run" command that will instruct the target to start the execution. In the release mode, the execution will start automatically, without any command from TIDE. That's what the release mode is for. "Normal" compilation only processes files that were modified since the last compile. Use Build > Rebuild All to recompile all the files in your project. There is also Build > Rebuild All and Upload. TIDE supports incremental uploads. These cache the previous build on the computer; when you make a modification TIDE makes sure the previous build is indeed what's running on your device now, and then compares the new build with the previous build. It then attempts to upload only what's changed. This really speeds up the upload process. Doing the full rebuild resets the cache. Next upload is always the full upload.